Quite intriguingly, there seem to be no accurate accounts of the largest bat ever found. Most texts go so far as to say that the flying foxes (megabats) are amongst the largest bats on Earth, with some individuals having wingspans exceeding 1.7m (about 5.5 ft.) and weighing in at more than a kilogram (just over 2lbs). 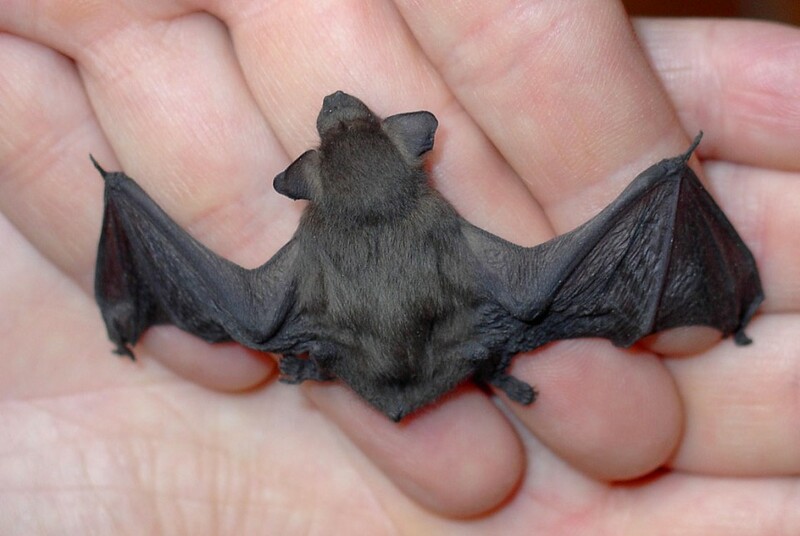 Conversely, the record of smallest bat species is held by the Kitti’s hog-nosed Bat (Craseonycteris thonglongya), with a wingspan of only 16cm (just over 6 inches) and, according to David Macdonald’s New Encyclopaedia of Mammals, a weight of 1.9g (about 0.07 oz.) – indeed this is the smallest mammal known to science. Among the British bat species, the largest are the horseshoe bats (Rhinolophidae), noctule (Nyctalus noctula) and serotine (Eptesicus serotinus), which are all roughly equal size – of these, the noctule is arguably the largest. Were the mouse-eared bat still a listed UK species, this would (just about) be our largest chiropteran. The smallest British bat species is the pipistrelle (Pipistrellus pipistrellus), the largest of which reach about 8cm (about 3 in.) long and weigh 8.5 grams (up to 0.3 oz. ); ordinarily, pipistrelles reach about 4cm (1.5 in.) and weigh only 5 grams (0.176 oz.). Incidentally, recent DNA studies have revealed that, what was originally thought to be a single species (P. pipistrellus) is actually two species that look very similar (P. pipistrellus and P. pygmaeus). This, so-called pipistrelle split, is covered in more detail in the Questions and Answers. Fur colour varies between species, from the more typical brown or black, usually paler underneath, to a pale orange in the Schneider’s leaf-nosed bat (Hipposideros speoris). Some bats display coloured patches, stripes or frosted tips to their fur. For the majority of species, telling the sexes apart can only reliably done with the bat in the hand to observe the sexual organs. During, and directly prior to, the mating season the testicles of males may descend from the scrotum making sexing a little easier at distance. Most species exhibit a sexual dimorphism in size, with females growing larger than males, particularly in species that produce large litters; but this often requires experience and may not be a reliable guide for all species or groups with mixed age classes. That said, some species have evolved pronounced sexual dimorphism, with the hammer-headed bat (Hypsignathus monstrosus) being one of the most striking examples; the males developing a long, horse-like face to accommodate the enlarged larynx that allows them to honk at females.